VIDEO: Lava flow from helicopter Sunday night. By Sen. Kai Kahele. Growth in tourism is affecting Hawaii residents’ quality of life. The unprecedented arrivals growth means that about 1 in every 8 people statewide are now visitors. On Oahu more than 1 in 10 people are tourists and on Hawaii island it’s about 1 in 7. On Kauai and Maui, more than 1 in four people are visitors. Star-Advertiser. Isle bankruptcies keep rising despite economic growth. Statewide filings in May soared 10.5 percent to mark the fourth time in five months they have exceeded the previous year’s total, according to data released Friday by the U.S. Bankruptcy Court, District of Hawaii. Star-Advertiser. Here’s How Much Hawaii CEOs Make Compared To Their Employees. The gap between CEO pay and the median salaries of their employees for Hawaii’s publicly-traded companies is narrower than nationwide. Civil Beat. Lobbying On Both Sides Of Medical Aid In Dying Bill Cost More Than $34K. Opponents spent nearly twice on lobbying and public relations as much as supporters in a failed attempt to derail the measure, according to state reports. Civil Beat. Proposed revisions to rules governing nearshore water events off city parks — anxiously awaited and debated in recent months by the North Shore community, surf meet organizers and the surfing public — were released Saturday by the Honolulu Department of Parks and Recreation. Star-Advertiser. The city will be hosting a meeting in early July to discuss changes to permitting rules for surf and shore water events on Oahu. Hawaii News Now. Some grave-site space opens at Punchbowl. Star-Advertiser. Rents for two-bedroom apartments in Honolulu have significantly declined over the past year, but still rank among the highest in the nation, according to two new reports from Apartment List and Zumper. Pacific Business News. Accidentally removed crosswalk in Hawaii Kai raises safety concerns. KHON2. HPD: Suspect lunged at police with a large knife moments before deadly shooting. Hawaii News Now. The leading edge of flow front is nearing the ocean as it moves through Kapoho on Sunday evening. Big Island Video News. Lava is advancing along a half-mile-wide front toward the ocean at Kapoho Bay between Kapoho Beach Road and Kapoho Kai Drive, according to the U.S. Geological Survey. Star-Advertiser. Hundreds of homes in peril as Kilauea lava flow nears Kapoho Beach Lots, Vacationland. A wide lava flow fanned out Sunday over farm lots as it edged closer to Kapoho Bay and threatened to bury hundreds of homes in Vacationland and Kapoho Beach Lots. Tribune-Herald. Lava Traveling Through Kapoho Beach Lots, Moving Towards Ocean. Hawaii Public Radio. A helicopter crew saved three Puna residents from the ravages of Kilauea on Sunday, hours before a magnitude-5.5 earthquake below the volcano’s summit sent an ash plume 8,000 feet skyward. Star-Advertiser. Evacuation order came suddenly for Kapoho residents. Star-Advertiser. Mandatory Evacuations Strain Residents and Responders. Hawaii Public Radio. Three people trapped by lava from the isolated areas of Kapoho and Vacationland in lower Puna were airlifted out by county rescuers. Hawaii News Now. The vent inside Halemaumau Crater is blocked with debris, preventing more large ash plumes for the time being. 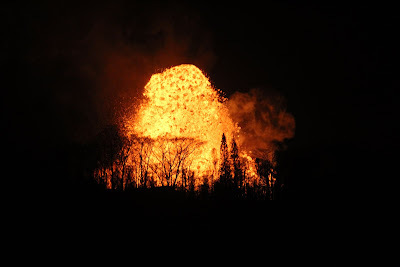 Kyle Anderson, a geophysicist with the Hawaiian Volcano Observatory, said it’s not known if this spells the end for the summit eruption or could lead to another explosion. Tribune-Herald. Department of Land and Natural Resources Division of Conservation and Resources Enforcement officers cited an additional eight people Saturday for loitering in a disaster area. Tribune-Herald. Department of Land and Natural Resources enforcement officers cited seven people Friday for violating area restrictions in order to get close-up views of lava flows in Lower Puna. Star-Advertiser. Big Island man arrested after going around a road block, crashing truck in cooled lava. Hawaii News Now. Residents affected by lava flow grateful for Hawaii National Guard. KHON2. Record number of earthquakes recorded at Kilauea summit. More than 500 earthquakes were reported at the summit of Kilauea volcano in a 24-hour period ending at 11 a.m. today, according to a Hawaiian Volcano Observatory seismologist. Tribune-Herald. There is NO tsunami threat to Hawaii after a 5.5 (preliminary magnitude 5.8) earthquake reported at 3:51 p.m. on Sunday, June 3, 2018, in the summit region of the Kilauea volcano, according to the Pacific Tsunami Warning Center. Maui Now. Lava flows reignite debate over safety and future of Puna Geothermal Venture facility. Star-Advertiser. Forestry managers on Hawaii island report one-third to one-half of the total acreage of the Malama Ki Forest Reserve has been impacted by the month-long East Rift Zone volcanic eruption. KITV. Norwegian Cruise Lines suspends Hawaii Island ports indefinitely. West Hawaii Today. A political movement born in the 2014 genetically modified organism moratorium vote has been gathering strength of late, inspiring a new group of candidates to run for elected office and perhaps upset the status quo in Maui County politics. Maui News. Candidates file nomination papers. Maui News. For the first time since deploying NARCAN kits to their front-line officers, the Maui Police Department recorded its first documented use of the kit in the field by one of its officers. Maui Now. Fish stocks could increase by 250 percent on Maui and 350 percent on Molokai if fishing were not allowed in certain areas of the islands, according to a recently released study. Maui News. Kauai Fire Department Chief Robert Westerman, 62, will hang up his hat and hose at the end of the year. Garden Island. Kilauea resident Adam Roversi, 49, a deputy county attorney for the County of Kauai in the office’s litigation division, has filed to run for the County Council. Garden Island. Learn about the impact cesspools are having on drinking water and sensitive surface waters at a Hawaii State Department of Health meeting scheduled for Aug. 1, from 6 to 8 p.m. at the Kapaa Neighborhood Center. Garden Island.